I feel compelled to write to you due to your recent vote-swinging and propaganda at the expense of the vulnerable campaign. Do you remember me, the vulnerable abuse victim who you left homeless and destitute with her career in ruins? Do you remember me, the vulnerable adult who you left voiceless and excluded from all your whitewash reports? Please stop this nonsense. You have more important things to do than spread propaganda through the press, you have abuse survivors who have not received justice, and you have not got around to publicly weeping over them for show, let alone administering justice. You and your church are embarrassing yourselves. You want people to vote Labour. Well how nice. But will Labour really care about the vulnerable and voiceless any more than the Conservatives and Lib-Dems? I doubt it very much. Why should they care? They want to get elected in order to rule and run the country, be in power, be the Voice that Makes the Rules. They do not want to be elected to fall on their knees and wash the feet of the homeless. Something that you don't do either. But I am sure that Labour are very glad of your support. I am sure they will write their lines in accordance with what you wish, and then throw them in the bin when they are elected. I am sure that either Labour or UKIP will be the next government, the coalition have made a dreadful mess, so is it just that you want to be seen as backing the winning party? Does that in some way boost your failing church, or is there a monetary agreement between you and Labour? You run the campaign, they promise to support your ailing failing and directionless church? You have made a stupendous fuss in the Press about 'caring about the poor and vulnerable' and how the government don't do this, and yes, you have mislead the kind of Sheeple who watch the Jeremy Kyle show, but the reality is, as you will see if you look at the thousands of comments on the Mail online's recent article, you undermine yourself by living in a palace and earning millions while your church effectively tax dodges by it's unique status of being a charity as well as a government department. Your own Parish Clergy are not well paid, and one of them used to grumble to me as she took me out for walks while her husband was abusing me, she used to tell me about her salary and about how the Bishop of Winchester's staff were cold to her about her marital difficulties and so she had to turn to the then Bishop of Basingstoke, Bishop Trevor for help with her marriage and domestic problems. So, basically, you are in the press about caring for the poor, when you do not even understand the poor or look after your own employees properly. Having read that, would you like to turn back to the problems of your own church and actually deal with my request for an independent inquiry on my case, an inquiry done from outside the church and including me this time, unlike the whitewashes and cover-ups so far? Jesus said 'Sell everything you have and minister to the poor', and you and your fellow Bishops, mainly privately educated, live in palaces and have no understanding of the poor or vulnerable, you really do not. And that is evident in your failure to deal with my case properly and your bias in favour of the wealthy and privately educated wrongdoers in my case, among other things. You are making a fool of yourself in this noisy affectation crusade, claiming to care about the vulnerable, and it is very typical of the Church of England to act in this duplicious way, and it is your trademark. Do you think you could give the propaganda and noise in the press a break, at least until you have dealt with my case properly, because in the meantime, you are dishonouring God. God does not like you being duplicious. And while you use the poor and the vulnerable for crocodile tears campaigns, you have shown without any doubt, in my case, that you have no understanding of the effects of poverty or trauma or what happens when you church accidentally or deliberately abuse people who are vulnerable because of poverty, disability or trauma. You and your church are a wealthy, outdated and abusive club for the elderly and wealthy, mainly benefitting old men and freemasons. And you need to look into your own church's problems before spouting on and on in the press about the faults of the government and others, or pretending that you care about the poor and vulnerable. You disgust me. You have left me destitute, living in fear of the next lot of defamation and whitewash and always in danger of losing my home and community as a result. I do not even have the money for therapy, and you owe me the money for my therapy and more, so please be quiet and deal with your own archaic and messy Church before continuing to mislead the general public. I thought it was horrifying that you shamelessly defamed your Father at Christmas, what kind of message does that give out to the general public and Church? After you said you don't believe in God - well why are you there if you don't believe? Just for the money and the palace? Again, in order to comply with Jesus teaching, you have to sell those, and the billions that the church commissioners sit on, and actually start using the money to tend to the poor, not just making an empty show in the press of caring. And what did Jesus say about that? Help people in secret, don't make a show as the Pharisees do! 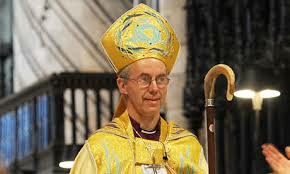 Justin Welby, I am going to send you a Bible, because you have obviously never read or understood Jesus teachings! I do not know if any other Archbishop has had such a long and loud run of propaganda and duplicity in the press, but it is terrible that you are misleading people that you care about the poor and vulnerable in order to curry favour. If you care about the poor and vulnerable, start by helping the one you have destroyed. What I find hard to understand is that the Church of England have been trying to use the poor and the vulnerable as a way of advertising themselves and misleading people into thinking you care, and yet, what are you actually going to do for the poor and vulnerable? Nothing. You have so little understanding of them that you have an apartheide policy against them, which reads that Church people, officials and clergy in the mainstream are not allowed to have vulnerable people in their homes, ever, not even for a coffee. THis does not only apply to me, because after my curate friend, Tracy LeCoutuer suddenly turned me away after she had always invited me home, because Jane Fisher had found out, and got Tracy to ban me without explanation, I was told by another curate who knew nothing about me and my situation, that this was the Church of ENgland's policy on vulnerable people! So how does a policy which separates the sheep from the goats help the vulnerable? Are you going to remove that policy, which you have for your insurance purposes and not for the sake of protecting the vulnerable, who are thus actually banned from part of church life for the sake of your insurers?! And they are banned without being told. So do you think you care about the vulnerable? You are not capable, from your palaces and wealth, of understanding the vulnerable and treating them as human. And unfortunately, with your show of caring, you may well mislead hundreds of vulnerable, who will try to seek comfort in the church, much to the dismay of the narrow elderly and wealthy who run the churches, who will insult, shun and discourage the vulnerable, thus causing them harm. At this point I recall a rich old lady loudly calling an autistic boy mentally retarded in a church, and this was only recently, not a few decades ago. So please, stop misleading people, it is so harmful, and it is only for your church's advertising, this pretence of care, and this duplicious pretence of fighting with the government and being their victims. A church misleading people that a different party will be better than the current government is not a good thing, misleading the vulnerable, pretending to care. In my years on the streets as a result of you destroying me and taking my home and livelihood, I found the Church of England to be the least caring and understanding denomination among those who worked with the poor, because your wealthy old congregations are not capable of understanding poverty and the reasons behind homelessness, so you tend to treat the homeless like naughty children. The vulnerable, poor and disabled the same. 'Thus shall be done to the person who reports abuse to the Church of England'. In slightly less developed countries, the priests and bishops tell the people who to vote for, I know this from a national of one of these countries. So you are trying to make the UK go back to a time and place when we should be good children and blindly believe a very flawed and abusive church on who to vote for, and believe that this flawed and abusive church knows best? It doesn't do any good in countries where it still happens, it is just an abuse of power and an abuse of God.